View of Kirkmichael 2 from south east. 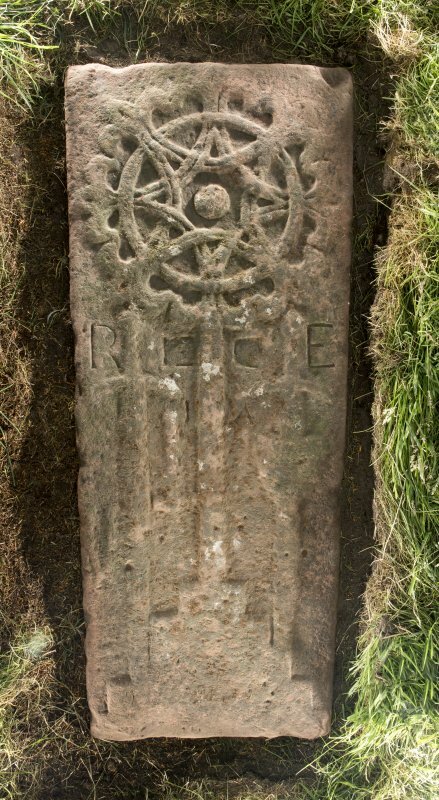 View of medieval recumbent grave slab Kirkmichael 1. View of Kirkmichael 1 from north east. 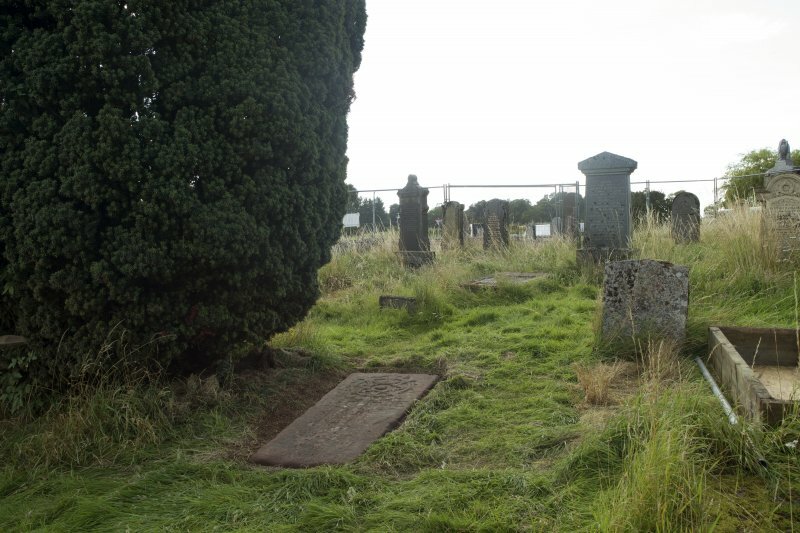 View of medieval recumbent grave slab Kirkmichael 2 (with scale). View of medieval recumbent grave slab Kirkmichael 1 (with scale). 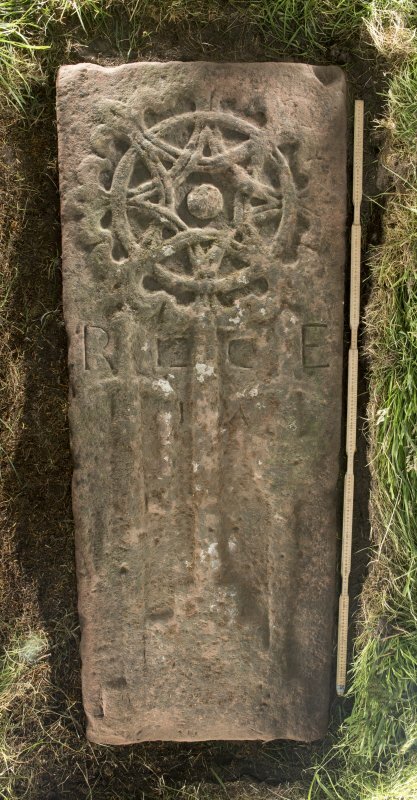 View of medieval recumbent grave slab Kirkmichael 2. View of Kirkmichael 1 from south west. 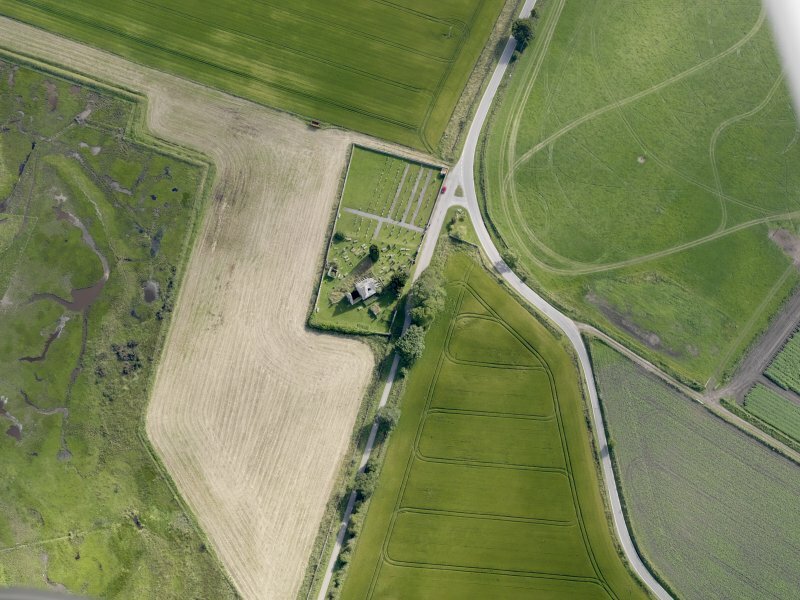 Oblique aerial view of St Michaels Chruch, looking to the SW.
St. Michael's Church was the parish church - and the origin of the name - of Kirkmichael, and became in 1662 the church of the combined parishes of Kirkmichael and Cullicudden, now called Resolis. 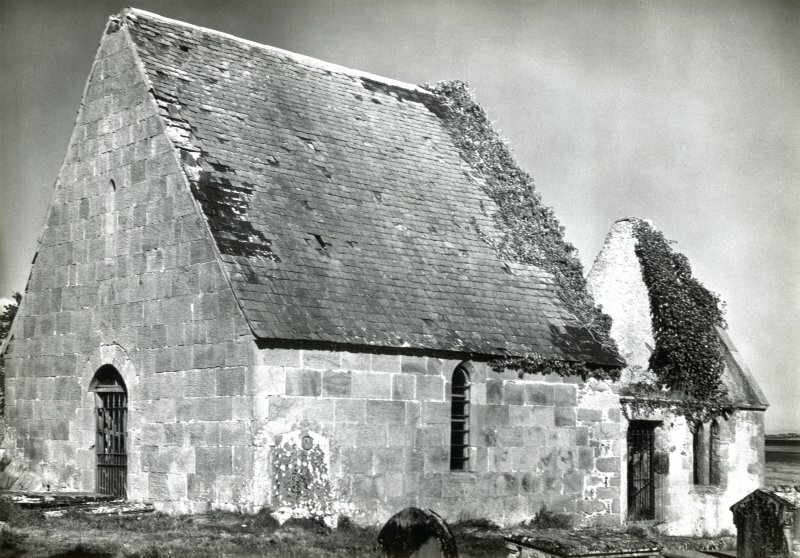 It continued in use until a new church was built at Resolis in 1767. Thereafter it was allowed to fall into decay. Part of the centre of the church was re-roofed in the 19th century for use as a mausoleum. New Statistical Account (NSA, written by Rev D Sage - 1836) 1845; Name Book 1875; W J Watson 1904; H Scott et al 1915-61. The remains of St. Michael's Church are oriented E to W, and consist of an unroofed chancel and nave. The roofed central portion, measuring 7.1m square, is a private burial place of the Munros of Poyntzfield. The chancel measures 5.8m by 5.4m externally with walls 0.7m wide. The most interesting feature of the building is the remains of a wall which projects westwards from the NW angle of the mausoleum. It is constructed of poorly-bonded, uncoursed, rubble-masonry, with small stone pinings. It is 3.6m in length, 1.3m high and 0.8m wide, with the remains of an archway visible on its inside face. It obviously pre-dates the mausoleum and chancel in construction, and is probably a section of the original N wall of the church. The name of the church was confirmed locally. Visited by OS (RB) 21 January 1966. B listed with remains of chancel dating to the 16th century. The chancel was reused as a burial aisle by the Shaw-Mackenzie's of Newhall. Site is a Scheduled Ancient Monument. Archive to be deposited in NMRS, including digital photographs. NH7059 6585 Four test pits were opened in the internal corners of what are now referred to as the chancel and mausoleum of Kirkmichael. 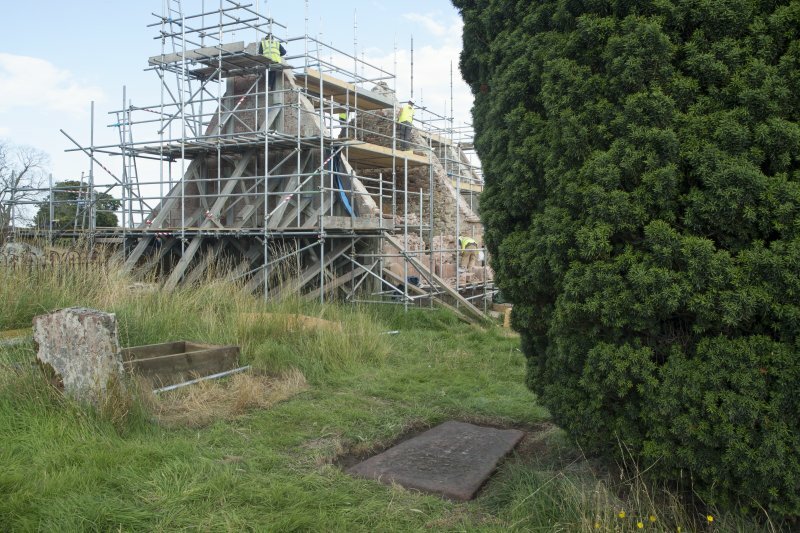 The work undertaken, 28 June – 1 July 2013, aimed to establish the nature of any wall footings or foundations and adjoining surfaces to inform conservation and reconstruction work. All test pits were 0.6 x 0.6m and bounded on two sides by the surviving wall structures. Test pit 1 was located in the SW corner of the Gun Munro mausoleum and was excavated to a depth of 0.45m. An organic-rich layer containing plant material was uncovered, which was of even depth and appears to represent a floor layer. Foundation stones underlie the current walls, at a depth of 0.45m below the current floor level and protrude for c0.3m inside the building. Made up of undressed local sandstones, this foundation differs from the roughly-dressed red sandstone blocks forming the walls. Given the small area exposed, it is possible that they represent residual stones from a previous wall or robbed out floor layer. Test pits 2, 3 and 4 were excavated to depths between 0.5–0.9m, but did not reveal any foundation or lower course wall layers. In some areas changes in render were noted, including a yellow clay sealing the gaps between stone in the lower wall of the easterly chancel, also known as the Urquhart mausoleum. Articulated human remains or those discovered within an identifiable burial cut were left in situ, but small fragments of disturbed human remains were recovered, as well as nails, shells, pottery fragments and glass sherds. 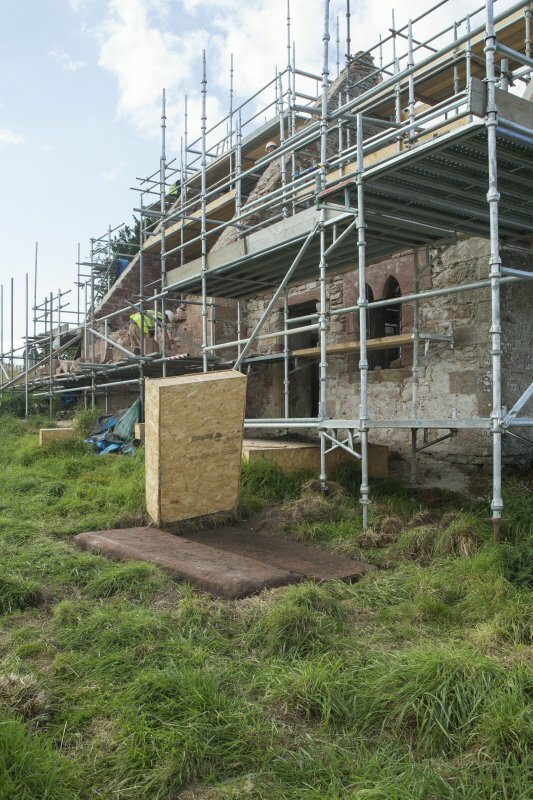 NH 70590 65855 A programme of work was undertaken at the scheduled monument of Kirkmichael Kirk during redevelopment of the kirk. A watching brief was undertaken, August 2016 – August 2017, throughout ground-breaking works to enable installation of drains, paths, services and signage. An excavation to lower the floor levels of the kirk was undertaken in October and November 2016. Excavations within the kirk revealed an earlier phase of wall and some material that may be related to a building or renovation phase. There was also a considerable depth of modern material, including wooden box-like structures and excess soil from grave digging. Many modern artefacts were recovered including bottles and vases. A scatter of 17th- and 18th-century coins are thought to have been imported with grave digging material, along with many disarticulated and fragmentary human remains. An unexpected find was a flint arrowhead, which may have also been imported with gravedigging spoil. The human remains have undergone basic analysis and have been reinterred within the graveyard. Twenty monumental grave ledger slabs were recorded during the watching brief. The majority of these were inscribed and dated from the 17th and 18th century. Three 17th-century slabs featured an inscribed claymore sword, which appears to be part of a local tradition during the post- Reformation period to include a known but suitably secular motif on monumental grave slabs. All the slabs were able to be preserved in situ. Fragmentary disarticulated human remains were recovered, assessed, and reinterred within the graveyard.